Our roadways are getting busier and busier by the day, and commercial vehicles are on the homestretch with their holiday deliveries. But with this increase in holiday traffic and increase in commercial vehicle traffic, we’re seeing a significant and serious increase in the risks for on-the-job car accidents. According to the Occupational Safety and Health Administration (OSHA), there were more than 3,000 people killed and another 420,000 injured in distracted driving car accidents in 2010 in the U.S. 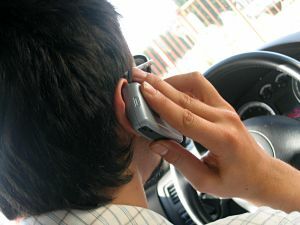 Many workers are required to stay connected with their employers during long delivery routes, but on the phone and behind the wheel is no time to stay connected. When commercial drivers use the phone behind the wheel, their reaction time is delayed. As a matter of fact, their reaction time is equivalent to that of a driver who is legally drunk. Our workers’ compensation lawyers understand that more workers are killed each year in motor-vehicle accidents than any other cause. And businesses can help to solve this big problem. The U.S. Department of Transportation’s (USDOT) has launched a campaign to help address distracted driving among working drivers. But is it effective without employer enforcement? This campaign is against distracted driving and is a multi-modal effort that includes automobiles, trains, planes, and commercial vehicles. The order also encourages federal contractors and others doing business with the government to adopt and enforce their own policies banning texting while driving on the job. Millions of workers’ jobs require them to spend part or all of their workday driving – visiting clients and customers, making site visits, or delivering goods and services. The extensive research on the impairments associated with distracted driving makes it clear that these workers are being exposed to a serious hazard when an incoming text from a supervisor or an urgent email request from a client draws their focus away from the road. In order for a driver to send or receive a text, he or she must take their eyes away from the road for an average of 4.6 seconds. This amount of time is equivalent to driving the length of a football field at 55 miles per hour while blind. It has also been determined that the risk for a crash is 23 times greater when text messaging than when the driver is not distracted. -Cognitive distraction is taking your mind off the road. -Visual distraction is taking your eyes off the road. -Manual distraction is taking your hands off the wheel. What can an employer do about distracted driving? A lot more than you might think. One of the first things that they can do to address the issue is to figure out how this risk could potentially affect your business. Identifying employees that drive as well as company processes that could potentially add to driver distractions. Then you can develop a plan which should include awareness, training, and a clear company policy dedicated to preserving driver safety.